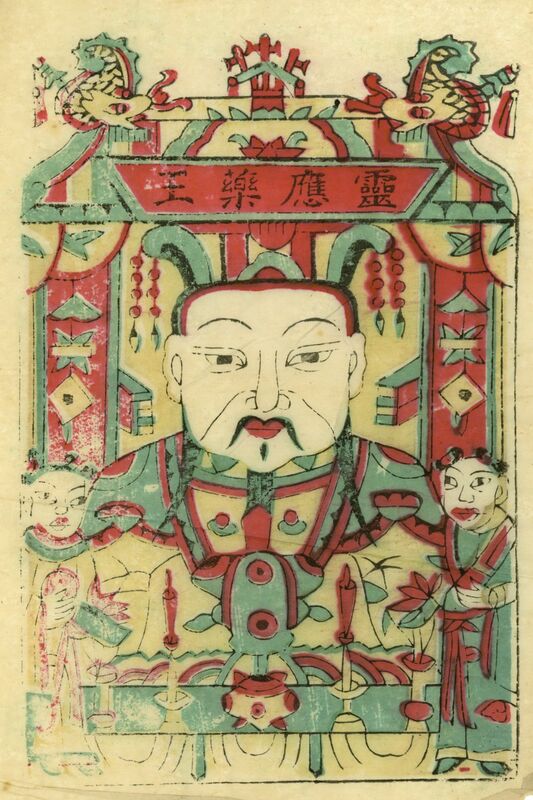 A wood block print of the lord of medicine Sun Si Miao, he was a doctor and Taoist priest of the Tang Dynasty. He is said to live to 140 years old. However, when he was sickly child, the family used up all their saving to treat his sickness. Being a very gifted child, he studied all forms of medicine, he dedicated his life to save as many people as he can and refused to become a doctor for the court. He has made a huge contribution to the Chinese medicine; not only did he wrote the “Thousand Golden Prescriptions”, a complete medical ethics, started gynaecology and pediatrics in Chinese medicine and more. This is a new year print that would be seen in Chinese medicine clinic. thank you for commenting on the blog. unfortunately i dont know enough about katsushika hokusai to comment on his work. generally, japanese ukiyo-e prints are more artistic (composed by an known artist for the prints) while chinese wood block print are more of a folkcraft (composed by an artistan with the composition passed down by previous generations). with the exception of yang liu qing prints where some of the prints are composed by artists.